Native American dances are a rich part of our nation's history, though they have been all but forgotten by the passing of time in many parts of the country. Below you will find facts and perspectives on three genres of Native American dances, providing a look at this unique form of movement. Now known all across the nation, Oklahoma City's annual Red Earth celebration has become a popular way to recall the ancestral roots of the Native Americans, while helping to raise awareness and support from upcoming generations. 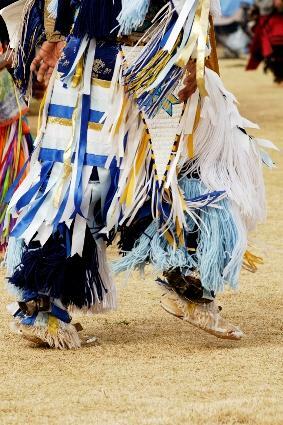 These yearly pow wows include a handful of varying dance styles, and some are held in a contest format, just like many modern genres of dance. Most, if not all, Native American dances are focused on following the distinct rhythm of a musical instrument - usually a drum. The Fancy War dance is a great example of this, as the steps are in sync with the drum beat while the head and body flow of the dancer is a free form of emotion. Dancers must be able to adjust their movements and mental state to the varying speeds and rhythms of the beat, and the dance is truly based in individuality. This dance was used as a form of personal expression in early Native American cultures, and this aspect is still strongly embraced today. One of several nature-based dances, the Grass Dance is best performed with fluid and graceful choreography. Representative of "harmony in the universe," body motions simulate the movements of long prairie grass blowing with a spring wind. The drum beat is the "mover" and the dancer's body is the blade of grass responding to this invisible push. Founded among Canadian tribes, the Jingle Dress dance has recently made its way into American festivals, prompting recognition and celebration of all Native Americans as opposed to those within the United States. A spiritual dance performed by ladies only, the Jingle Dress dance is extremely colorful and also provides its own music via the bell-like fringe found on the dancer's costume. Found in almost all tribes, one of the most popular of Native American dances is the Rain Dance. Usually taking place in late August, ancient tribes depended upon this ritualistic movement to summon the rain to come and restore their resources during the driest time of year. Today, the rain dance is more symbolic than spiritual, however many tribes continue to make it part of their culture. Both men and women participate in rain dances, wearing specially designed headdresses and costumes designated for the occasion. The use of turquoise is also especially significant, and the dance is rarely performed without the incorporation of this precious stone. In the ancient Apache tribe, medicinal dances used to be a regular occurrence for healing. Today they are less frequent, but still hold much symbolism and meaning when it comes to the tribe's beliefs in healing and hope. Native American dances often involve more than just typical dance movement, and the medicine dance is no exception. It often involves the incorporation of a lodge, various paints representing different aspects of nature, and usually a feast. The patient then steps upon a pre-prepared sand painting, and others dance around her and chant healings. There is obviously not much scientific merit to medicinal dances, however they are still an integral part of Apache culture, as well as other Native American tribes. Dance itself has always played a pivotal role, and will continue to do so for generations to come if today's tribes work to keep their traditions and values alive in an ever changing world.